Swedish Dubbelmossa, Watermelon Socks & Prom? Spring is one of my favorite seasons for so many reasons. The school year is ending which makes the kids happy. The trees are bursting with leaves and blossoms and the grass is getting greener than green. The warming temperatures and end of the school year events add to the spring excitement. It is inspiring and energizing to say the least. I'm diving into the season full-force which includes embarking on a serious deep cleaning and de-cluttering of neglected drawers, closets and corners of my house. Earlier in the season I went through my closet and dresser drawers and I got rid of so much stuff. I reorganized and folded and hung everything in order. I have kept it up really well, too. I always have good intentions to be organized but when things get hectic it is the first thing to go by the wayside for me. So last week I devoted hours and hours to cleaning out my tiny home studio. I pulled out every cubby, drawer, bin, basket, and bookshelf. And I completely reorganized my needles. Needle organization is an ongoing battle for everyone I am sure. When I am traveling and teaching and I have new design deadlines things can get a little disorganized and cluttered. I try not to worry about it when it is happening because I think it's part of the creative process for me. I immerse myself in the project at hand and in doing so I become a bit oblivious to daily organizing duties. I always have faith that I will get back to it when time allows, and I always do eventually. Anyway, my little knitting studio feels wonderful and fresh and clean now. Mainly, it makes me feel lighter and happier and it makes working a lot more enjoyable like a heavy weight has been lifted off my needles. I have found so many fun knitted things from the past as I've sorted. Click here and here to go down memory lane with me. I'm amazed at how well these things have held up. Now onto some knitting. When I was at Yarnover in Minneapolis a couple of weeks ago the keynote speaker was Meg Swansen. I have seen Meg speak one other time and it is very possible that she is my favorite. I love that she is so articulate and funny and smart. I love that she always has interesting and new to me knitting information. I love that her mother is Elizabeth Zimmermann. I love the way she talks about her family and her home, a renovated one-room schoolhouse, located in small town Wisconsin. She is charming, endearing, fun and simply interesting. If you get the chance to hear Meg speak or take a class or attend Knitting Camp over the summer I highly recommend it. In fact, it should almost be a requirement. Click here for Meg's website and online store, Schoolhouse Press! Sign up for the newsletter, too. Anyway, when Meg was speaking Anne Berk, a fellow instructor (check out her new book, Annetarsia, it's pretty brilliant! ), shared some of her finished Meg Swansen designs. The one that really caught my eye was her Swedish Dubbelmossa. Anne and I walked back to our rooms together later that night and I got to check out her fantastic hat much more closely. I was fascinated and wanted to cast one on for myself immediately! 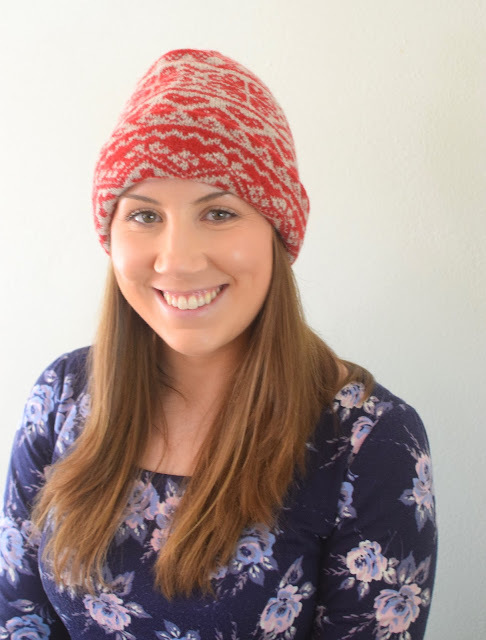 Click here to see the Swedish Dubbelmossa on Ravelry! Click here to check out Jamieson's Spindrift (I used Crimson, Oatmeal and Lagoon) on Schoolhouse Press! Click here to see the book, Handknitting with Meg Swansen, for the pattern! I used a US size 2/3mm 16-inch circular and dpns to knit the hat. You start with a provisional cast on, I used the crochet version. Click here for my video tutorial on the provisional cast on! I worked on the blue lining and the colorwork simultaneously which was fun. If I had a few minutes for mindless knitting I worked on the blue end and if I had time to sit and concentrate I worked on the stranded knitting which requires reading the charts. I just kept alternating like this until it was finished. The first photo is an in-progress shot of working from both ends. I used two circular needles, one for each end of the hat. Dubbel means double and mossa means cap so Dubbelmossa is a doubled-hat. It is worked from the provisional cast-on out on both ends in a tube. The lining end, the blue side in this case, is much shorter in length to accommodate for the turned up brim or cuff. The cuffed part of the hat is actually four layers so it is a very warm hat. The lining end is punched in and tucked inside of the colorwork end. The shot of blue is like a hidden surprise inside. I love that. The decreases at the top are worked every round which makes for a pointy top. If you wanted a smoother or rounder top you could work a knit round in between the decrease rounds. I like the stripy point, it's cute. The hat has quite a snug fit. When I was knitting I worried that it would be too big in circumference but when it is layered and the brim is folded up it takes up the extra fabric. Thank you to the beautiful Miss Molly for modeling for me. She is marrying my son this coming July so the excitement is building. We are so lucky to have Molly in our family. I recommend the Dubbelmossa pattern. It is not difficult, very straightforward, really you are just reading simple charts. It is a great way to practice stranded colorwork. 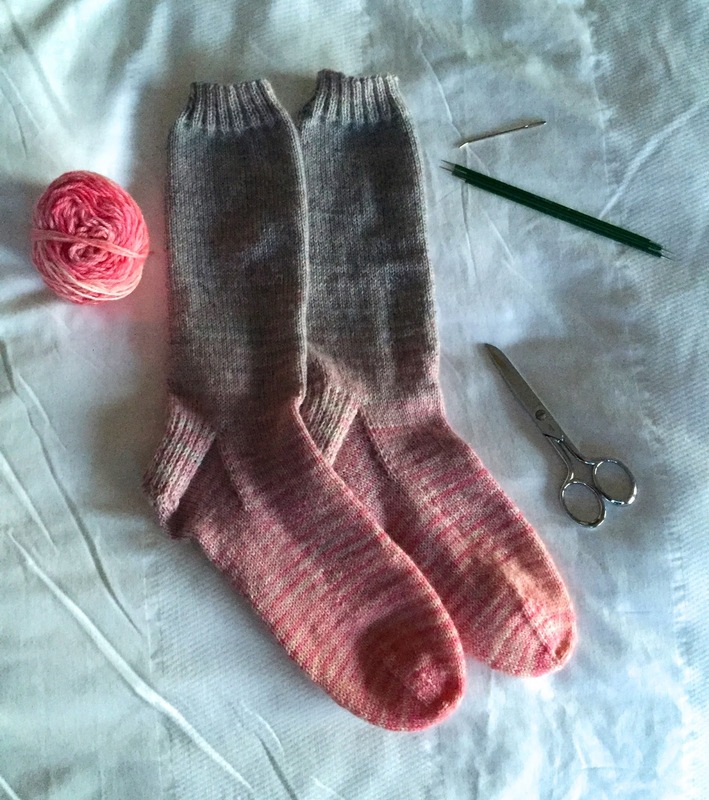 While at Yarnover I finished the Come What May (the colorway name) socks I started a long time ago. 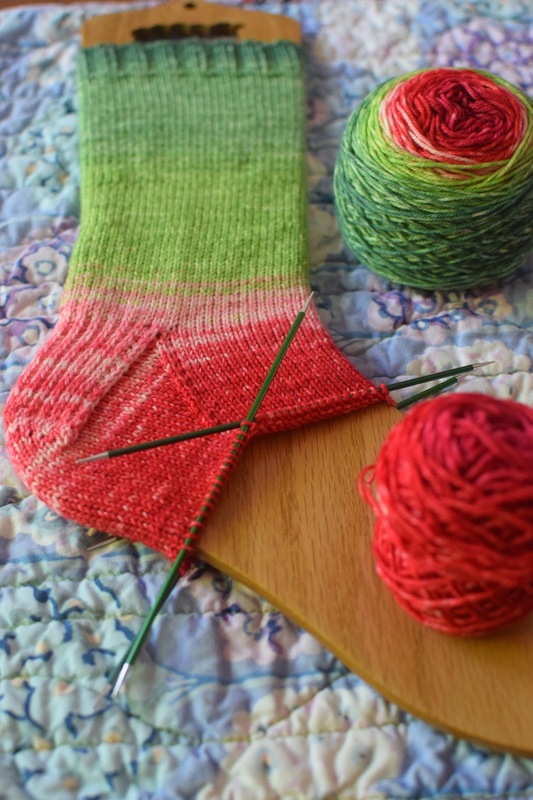 The yarn is from Knit Circus and it is the Matching Gradient Stripes Socks Set. The photo was taken in the very early morning in my hotel room. Click here for Knit Circus Yarns. Since I finished the socks while at Yarnover and Knit Circus was at the market I couldn't resist picking up the Watermelon Gradient Matching Socks Set. Here is my progress on the first sock. It's a beauty and very seasonal. 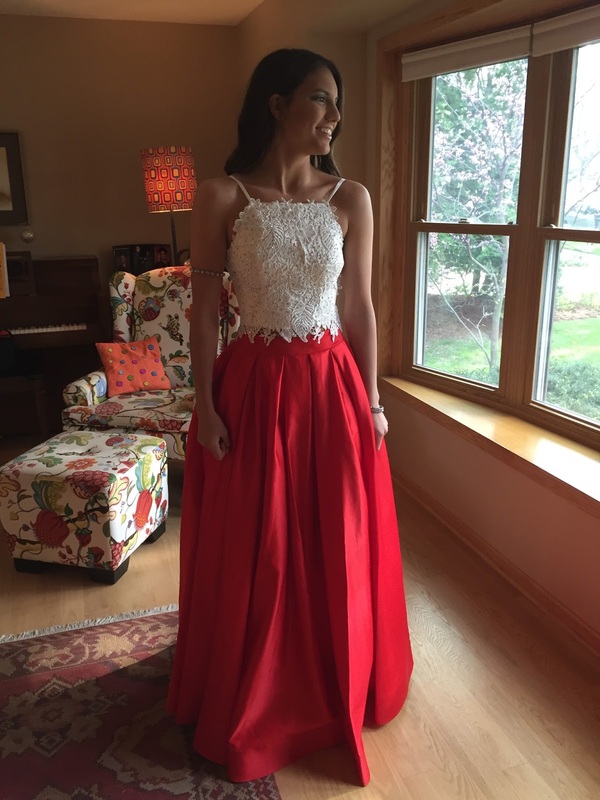 I had to share the lovely TC in her prom dress. I adore the two-piece dress she wore to her first prom last weekend. The full skirt even has generous pockets. The dress fit like a glove and when she had her heels on the length was perfect. She had a wonderful time and it was a great success. A quick update on a couple of things. I am going to be teaching at Fibre Space in Alexandria, Virginia, from May 19-21, 2016. There are few spaces left in a couple of classes (Egg to Owl and the Build a Toy have spots remaining), the rest are sold out, thank you for that. If you are in the area I'd love to see you! Click here to see my class offerings! The last thing is that my Creativebug class filming had to be postponed due to some scheduling conflicts at the company. So I was not in San Francisco last week shooting workshops, instead I was home cleaning, such a glamorous life I lead. I will keep you posted when I get that back on the books, I don't think I can squeeze it in until next fall so it will be not be for quite awhile. I will be getting the new Sheep pattern up and available in my Ravelry pattern shop by the end of this week. I shared the new Sheep on my last podcast episode. Hopefully I will get a new podcast up this week with a super fun giveaway for you. Stay tuned.